When was the wheel invented? How fast is a bullet train? What makes a car go? 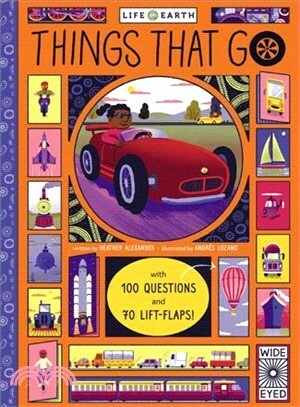 Find out in this interactive book with 100 questions and answers, and 70 lift-the-flaps to explore. Lift the flaps to look inside a car's engine, learn about farm machines, find out about aircraft, see the fastest vehicles, and take a closer at emergency vehicles, construction machinery and submarines. Heather Alexander is the author of over 40 books for children, both fiction and non-fiction. Recent titles include Life On Earth: Human Body and Life on Earth: Farm (Wide-Eyed Editions), A Child’s Introduction to Art (Hachette) and Across the USA (Kane Miller/Ivy Kids). ANDRES LOZANO is an illustrator from Madrid, who currently lives in London. He lists his inspirations as nature, architecture, Franco-Belgian comics and film noir. His work is characterised by overlayed colors, textures and strong line work. He has worked with The Wall Street Journal, The New York Times, The Sunday Times, and Anorak.